Last night, I had a very insightful and wonderful dream of Lord Skanda. I was seated in front of an altar. I recall that I was singing a song and crying. Tears were flowing like a river in spade down my cheeks. The song I was singing was Kanthar Anubhuthi! I remember looking at a picture of Lord Murugan's feet. It was the picture from our altar room, where He is flanked both sides by Sri Valli and Devayanai. I was intensely focussed on Lord Skanda's feet! I then wiped the tears off my face. As I was doing this, I felt the presence of someone beside me. I looked to my left and there was a person seated to my left! He was about 12-13 years old, fair-skinned, very pretty, dark black hair, and wearing pure white veshti. He (Skanda?) also had an aura around Him of golden light. As he turned to face me, I foolishly ignored Him and continued to place the target of my devotion at the altar on Sri Skanda's feet. I then awoke. "As a result of reciting his [Arunagirinathar] Thiruppugal and other works, such as Kanthar Anubhuthi, a distaste for wordly pursuits and an aspiration to attain God might arise in a person, and he would like to practise some sadhana to have God-Experience, but would be at a loss to know what to do. Arunagrinathar, therefore, gave Kanthar Anubhuthi as a divine gift to those seeking God-Experience (Anubhuthi)." I have always cried within and without for not having a SatGuru. It was only then that Sri Skanda came to me as my SatGuru (see below). Darshan - Satguru: Who is my SatGuru? He not only showed me that He (God) would be my SatGuru but He also initiated me into repeating His sacred mantra (see below). Moreover, Lord Skanda also helped me as I struggled for over a year to learn Kanthar Anubhuthi (see below). Having had these wonderful and blessed experiences, there came a natural craving in my heart. I want to have a direct experience of Lord Skanda. I want to see Him with my physical eyes. I want to see His beautiful divine form and melt in utterless bliss. I want to worship His beautiful feet and do pada puja to my beloved SatGuru. I want to sing Arunagirinathar's Thiruppugal to Him as I wash His feet with the love from my tears. This is the relentless craving I have inside me that grows day by day. This urge for some reason has developed over my four years of sadhana, of following and studying His works, which include: Kanthar Anubhuthi, Thiruppugal, Thirumurugaatruppadai, Skanda's Divine Discourses, and Thevaaram. And after four years, I have been give a clue as to the means of attaining Him. Pray to and think of His feet everyday. Worship those feet with intense devotion. Study Kanthar Anubhuthi's esoteric meaning; for it contains step-by-step instructions given by Saint Arunagirinathar on attaining Bhagavan Sri Skanda. How can that be told to another? Is it something to say! 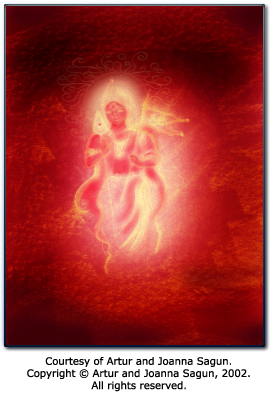 "That Divine Experience which Lord Vel-Murugan, Whose Form shines like the crimson sky (at sunset), revealed (to me) from within, on that day, as having no comparison to it,Unless that Experience is had by one as such and experienced as such, how can that be related to another? (It is impossible to relate that Experience.)" Thank you, God Skanda so very much from the deepest love and humility in my heart. How you answer and heed to my cries out to you. I love you so much. How much love you shower on us? How many births would it take for me just to show my gratitude of equal-worth? Thank you also Sri Arunagirinathar. Were it not for your work, I would not even be experiencing all this. My humble pranams at your feet. Bhagavan Sri Skanda-ki Jai! Arunagirinathar Swamiji-ki Jai!